The purpose of art is not the release of a momentary ejection of adrenaline but, rather, the gradual, lifelong construction of a state of wonder and serenity. Since it’s Friday, I figured I’d move away from talking about libraries , and touch on something I’ve been obsessing about over the last 24 hour or so, the ending of Donna Tartt’s new novel, The Goldfinch. Tartt spends the first oh, 750 pages of the book documenting, unrelentingly, the existential anguish of her Turnbull & Asser clad narrator, Theo Decker. From the death of Theo’s mother in a freak terrorist attack when he’s a boy, the less dramatic but no less sudden death of his abusive, alcoholic, gambling addict father, his own drug addiction and drug overdoses, the betrayal of his friends, and his unrequited love for the only person who could truly begin to understand his pain – plus a few stubbed toes I’m sure she forgot to mention – Tartt concretely demonstrates again and again the fact that the existential truths of life – the loss of loved one’s, one’s own morality, the lack of an objective and pre-defined meaning – are pretty damn terrible. She does this brilliantly. The book was so heavy and long I dropped it while falling asleep one night and it woke up my girlfriend yet, still, I read it as slowly as I could because I didn’t want it to end. But then, somewhere about twenty-pages before the ending, Tartt decides to abandon her gift for storytelling and just go ahead an tell us all what it all means. I don’t think I’d be spoiling anything to let you in on Tartt’s little secret, that human life is more or less terrible; you’d be insane to want to do it all over again; but if you happen to be born into this, and are an existential grown up who realizes you can’t rely on God to supply meaning, it’s art – making it and appreciating it – that ultimately makes life worth living. Tartt’s position seems to be a Nietzschean one, that “only as an aesthetic phenomena is existence justified,” because, even in the face of all the terrible existential truths of the human condition, art draws us back to life. It shouldn’t be surprising that Tartt would be giving us a little Nietzsche 101: her background, as is well known, is in the classics, and Nietzsche’s book on Greek Tragedy is where he most famously lays out his aesthetics. 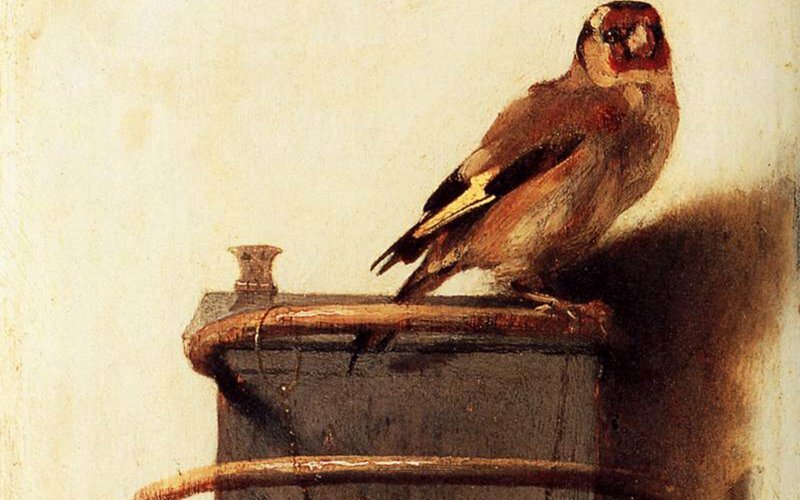 One of Nietzsche’s central preoccupations is how to overcome nihilism; this concern, at least in The Goldfinch’s final pages, seems to be Tartt’s as well. And the answer, for both Tartt and Nietzsche, seems to be that art makes life worth living. Whatever teaches us to talk to ourselves is important: whatever teaches us to sing ourselves out of despair … Death always wins but that doesn’t mean we have to bow, and grovel to it … maybe even if we’re not always so glad to be here, it’s our task to immerse ourselves anyway: wade straight through it, right through the cesspool, while keeping eyes and hearts open. Happiness and the absurd are two sons of the same earth. They are inseparable … It is not that discovering the absurd leads necessarily to happiness, but rather that acknowledging the absurd means also accepting human frailty, an awareness of our limitations, and the fact that we cannot help wishing to go beyond what is possible. These are all tokens of being fully alive. “The struggle itself toward the heights is enough to fill a man’s heart. One must imagine Sisyphus happy” (MS, 123). Refusing to pull back from the world … increasingly I find myself fixing on that refusal to pull back .. Because, here’s the truth: life is catastrophe. The basic fact of existence – of walking around trying to feed ourselves and find friends and whatever else we do – is catastrophe … For me – and I’ll keep repeating it doggedly till I die, till I fall over on my ungrateful nihilistic face and am to weak to say it: better never born, than born into this cesspool (767). And I add my own love to the history of people who have loved beautiful things, and looked out for them, and pulled them from the fire, and sought them when they were lost, and tried to preserve them and save them while passing them along literally from hand to hand, singing out brilliantly from the wreck of time to the next generation of lovers, and the next (771). I suspect that, philosophically, none of this means particularly much. But I find it moving nevertheless. For, as much as anything else, I’m just a kid who was saved by books … and maybe Donna Tartt is sort of saying the same. And that’s neither rational nor irrational; justified nor unjustified. It’s just something you either identify with or you don’t.